Despite the fact that Central Park South has fantastic views of Central Park and the skylines of the Upper East and Upper West Sides and is anchored at its east end by the Plaza Hotel (see The City Review article), the city's most famous hostelry, it has never quite become the city's most chic boulevard. Just when some of its famous hotels such as the Art Deco-style Essex House (see The City Review article) and Barbizon Plaza (see The City Review article) opened, the Depression knocked the wind out of it. After World War II, the bland gray boxy bulk of the New York Coliseum would soon be erected blocking its westward vistas. In the 1970s, Harry B. Helmsley built the tall but less than inspired Park Lane Hotel not far from the Plaza. In the late 1990s, when the city was in the midst of a major real estate boom, this building, the former St. Moritz Hotel, which had previously closed its famous sidewalk café, closed Rumplemayer's, its famous and not inexpensive ice-cream parlor. 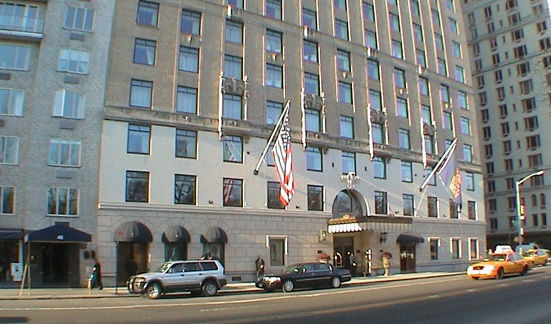 For many years, the St. Moritz had been the "bargain" hotel on Central Park South, but at the end of the 1990s, a bidding war erupted over it and Donald Trump announced he planned to acquire it to add to his already impressive portfolio, which also included, Trump Parc, an apartment building, directly across the avenue from it and Trump International Plaza (see The City Review article), a mixed-use project, at Columbus Circle. Mr. Trump, however, was unsuccessful and Ian Shrager, the former partner of Steve Rubell in Studio 54 (see The City Review article), the legendary New York disco of the late 1970s and early 1980s, who became the developer of several boutique hotels such as Morgan's and the Paramount, won the St. Moritz property. In the spring of 2000, a new deal for the hotel was announced under which it would be renovated as a luxury hotel by the Ritz-Carlton chain and topped by 12 floor-through apartments developed by Millennium Partners, one of the city's leading builders of apartment buildings. 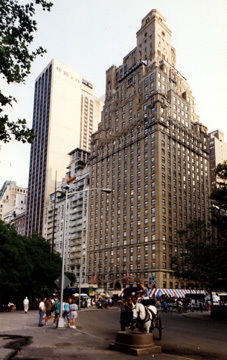 The former St. Moritz Hotel was designed by Emery Roth & Sons, the architects of such legendary residential buildings as the San Remo (see The City Review article) and the Beresford (see The City Review article) on Central Park West, the Normandy on Riverside Drive and several on Fifth Avenue, as well as many major office buildings. While the Central Park South facade of the building is attractive, its south facade is quite unusual with many terraces and arched windows and its upper floors have excellent views of midtown. In the late 1990s, this neighborhood underwent a significant renaissance with the opening of many theme restaurants and brasseries and the approval, after more than a decade of controversy, of plans to redevelop the former New York Coliseum site at Columbus Circle with a huge mixed-use project that became the Time Warner Center. To the east, the news was also good as the Plaza Hotel reopened in 2008 after a $400 million renovation as both a hotel and a condominium apartment property. There are two supermarkets nearby as well as Carnegie Hall and Bergdorf Goodman. There is excellent cross-town bus service on 57th Street and a nearby subway station and a McDonalds, Staples, Rizzoli's, a Radio Shack, a locksmith very close by and other bookstores and a large computer store not far away. The entrance to the Central Park Drive North is at this corner, which is a busy intersection. This building site was formerly occupied by the New York Athletic Club in a building designed by W. A. Cable. The club moved in the late 1920s further west to its present location at 180 Central Park South (see The City Review article).